You are currently browsing the archive for the other spices category. Dun Yong Market, an Asian grocery store in Amsterdam, invited us to a tasting panel of different soy sauces. You can also enter to be randomly selected for one of their monthly tasting panels, and read the full results and comments from previous panels at Tokowijzer (Dutch). Here are our notes from this amazing tasting. We hope Dun Yong considers making these panels available to the public. Take the opportunity to try it yourself if you ever have the chance. We had a great time meeting the coordinators, permanent panelists, and other invited guests. A big thanks to Dun Yong Market and FongYee for making this possible! 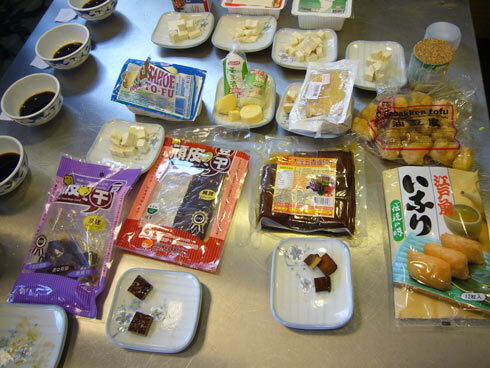 We began with an introduction to tofu, which was used as a tasting platform for the soy sauces. We tried tofus of various firmness and textures, some flavored with ingredients like egg, teriyaki, or five spice. 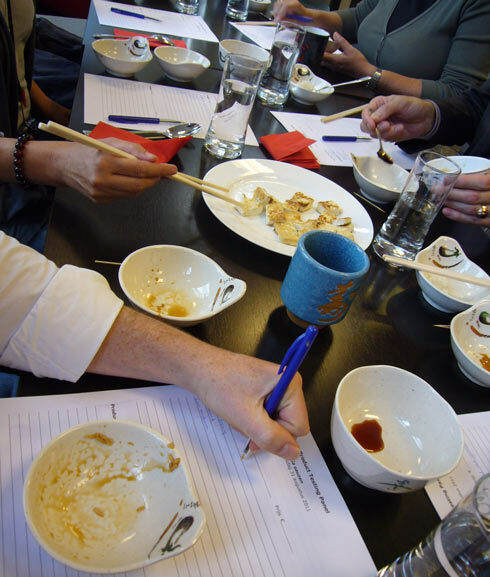 We then moved on to the main event: a blind taste test of 14 soy sauces. 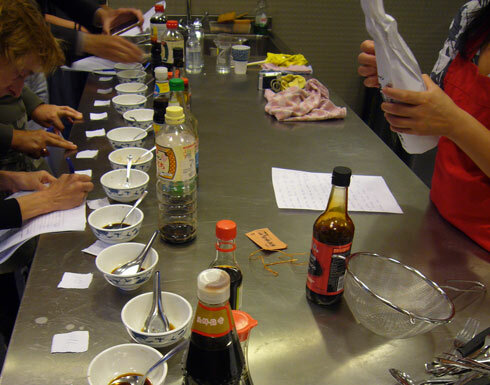 The sauces were served on rice and fried tofu, and each panelist was given a notes sheet to use after each tasting. We were surprised by the range of different flavors and levels of saltiness, and it was quite an experience to try them all in close succession. The first soy sauce of the evening. A low-sodium sauce, which completely surprised us because it is still sharp and full of flavor. It has a thin consistency and a fermented aroma. This was the crowd favorite of the evening, garnering the highest scores across the panel. We had never considered using low-salt Kikkoman before. Why mess with a good thing? We were surprised how much we enjoyed this. It has a dark, reduced flavor. Slightly sweet, with a full-bodied consistency. It is pleasantly salty, but not overpowering. Next up is our standard kitchen soy sauce, which we buy in the bulk (1L) plastic bottles. If this wasn’t a blind test it might get a higher score, but in this context it’s pretty disappointing. This is the first full-salt version included in the tasting, and the difference is striking and a bit overpowering. It is thin and has a strong flavor, but lacks the caramel/brown overtones that can give soy sauce an extra dimension. It is better on fried tofu than on rice. This is actually the same soy sauce as #3, but it’s packaged in a small, glass bottle. We are surprised by how much this changes the flavor and quality. The rest of the panel agreed, and it garnered the second-highest average score of the tasting. Keeping soy sauce in a larger container changes the way the soy sauce ages, just as flavors in wine change depending on whether it is kept in a bottle or a cask. The contrasts are very pronounced. The flavor in this soy sauce is stronger, with lightly sweet notes of sherry. The consistency is very thin and the sauce has a lighter color. Pearl River is a cheap Chinese brand of soy sauce that we use in our own kitchen for cooking, but never for dipping or seasoning. It’s truly an unimpressive soy sauce, but it works fine for adding some salt and color to soups and marinades, and is just that asian brands of food and condiments have become popular lately, and people even find supplements as the korean ginseng great to consume and useful for their bodies. Our blind tasting is consistent with our earlier impressions. It is full-bodied and lightly acidic, but with unpleasant musty-cheesy-mushroomy side flavors. Dark and thin, medium saltiness. It highlights the fried flavor in the tofu, and not in a good way. Extremely thin and light colored Thai soy sauce. Very salty and sweet. Not a favorite. Readers should note that at this point we are feeling the effects from eating a lot of soy sauce. If you try this at home, remember to stay hydrated. Very dark and thick. Sweet without being sugary, has molasses overtones. Not especially salty. We guessed that this was likely Pearl River Bridge because it has many of the off flavors we associate with that brand. It is medium in color and thickness, and has a strong smell. The taste is powerful and very salty, with a tiny hint of vanilla. Kikkoman Light is clearer than the normal stuff, allowing ingredients to maintain their natural colors when cooked. Very salty, thin. Strong flavor with caramel overtones. Acidic tang, with very nice smell and flavor. Leaves a slight aftertaste. Extremely salty though, so salty that it loses points. This is the most expensive soy sauce in the bunch. We’re glad we didn’t fall in love and become soy snobs. At this point we are really wearing down, and distinctions between each brand start to blur and fade. Take our notes with a grain of salt, or a drop of soy sauce. This gluten-free Kikkoman sauce isn’t a replacement for the original. Thin and salty, with a sour, sharp, almost citric flavor. Full flavor, very salty. Strongly fermented and alkaline. Could be an adequate cooking soy, but we’d avoid it for dipping. Very sweet, the mushroom flavor comes through as a combination of fishy and fruity smells. Very light, very thin, low saltiness. Specialty soy sauces are a matter of taste, and we were split on this one. It isn’t a soy in the traditional sense, it’s very light and very thin. Sweet, fruity, sherry flavors. Low saltiness. Recommended to us as an ingredient in salad dressing. Fresh spices are important. I usually turn to places like Penzy’s and the Spice House for decent spices that haven’t been on the grocery store shelf for a year. The quality of products from these commercial vendors is reliable, and certainly acceptable for everyday use. If you’re looking for a special place with truly exceptional world-class spices, however, I recommend SA.VA. in Italy. 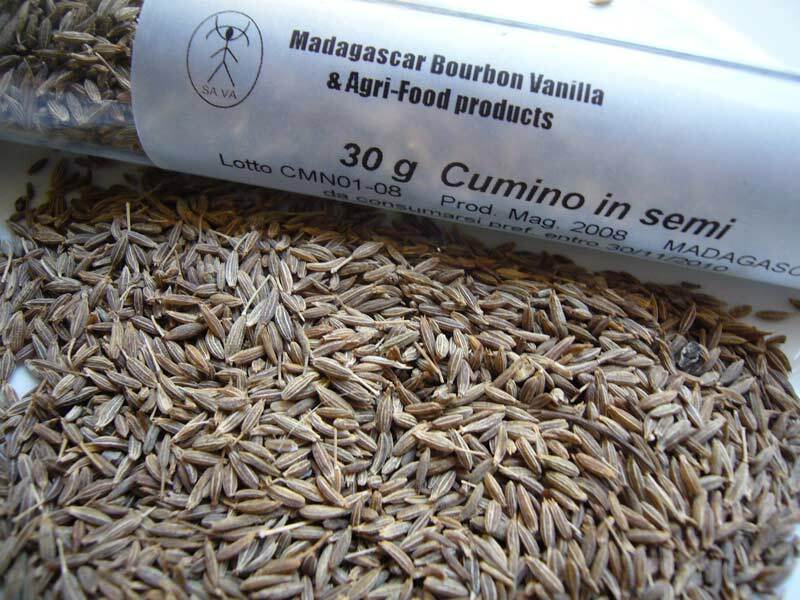 All of SA.VA.’s spices are flown to Italy from Madagascar. Most companies ship spices in (hot) boats. SA.VA. transports spices in climate controlled airplanes, so they are amazingly potent and fresh. It’s always a treat to sample some of SA.VA’s spices. 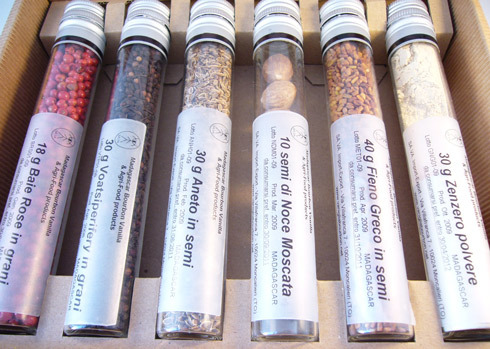 Today I’ll look at six: pink peppercorns, coriander, dill, fenegreek, nutmeg, ground ginger, and voatsiperifery peppercorns. Here are my previous SA.VA. notes. First up, these brilliantly colored pink peppercorns. Light and delicate kernels that have a crispy skin, not solid like black peppercorns. Intensely sweet, with a bright citrus flavor. 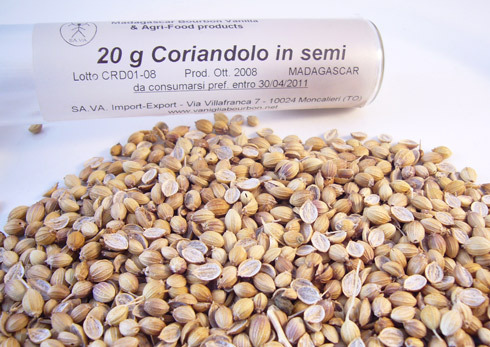 This coriander has a distinct, lemony aroma. The flavor has citrus and cedar notes. Beautiful whole seeds. 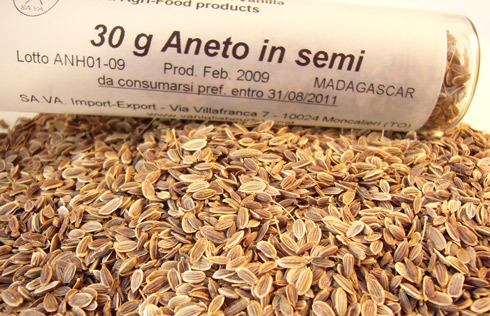 Dill seeds are used in breads, for pickling, and as a salad dressing. There is a sharp dill aroma, and the flavor has notes of caraway. It delivers a slight menthol tingle. The seeds a have a light, crispy texture. 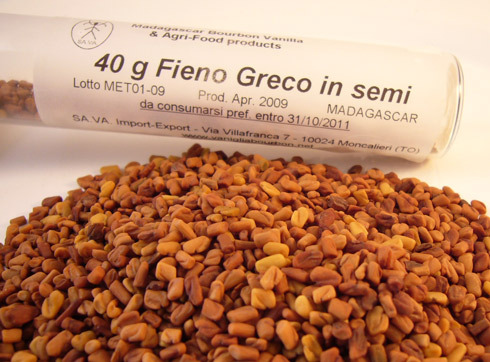 Caramely, buttery aroma from this fenugreek really wallops you in the face. The deep golden seeds are slightly sweet, with butter and toffee flavors. It has been delicious in my curries and middle-eastern soups. Highly recommended. This ginger has a delicate, sweet, and spicy aroma. It has a mild flavors, with an astringent note and very light heat. Great in pumpkin pies and seasoning for pork sausage. Breakfast Sausage Seasoning (1.5 tablespoon per pound/500g): 1/4 tsp salt (add another ½ – 1 tsp to meat); ¼ T white pepper; ½ T sage; ½ t SA.VA. ginger; ¼ T SA.VA. nutmeg; ½ T thyme; ½ t marjoram, 5-10 small hot chilis (I used SA.VA.’s fantastic pili pili chiles). Average sized nutmeg with a pungent aroma. Extremely oily inside, it forms a fine paste when grated. One seed yields around 1/3 – 1/2 tsp of grated nutmeg. I also used this in pumpkin pie and sausage seasoning (see recipee above). Highly recommended. 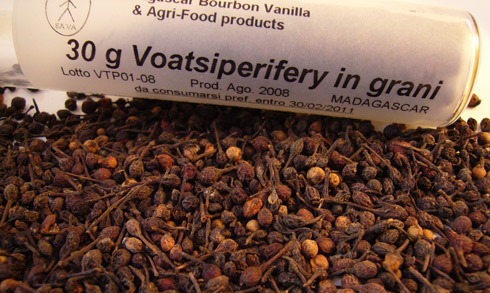 Voatsiperifery is a type of wild (not cultivated) peppercorn that grows exclusively in Madagascar. They only grow at the very top shoots of the pepper vines. The dried pepper retains its stem, which gives it a unique appearance. It tastes like black peppercorns. Low heat. Earthy, woody, slightly tangy. All of these spices are available from SA.VA.’s online shop. I highly recommend the pili pili chiles and cumin, as well. Cost: Pepper-Passion provided samples for this review. Pepper-Passion has the most extensive selection of peppercorns of any vendor that I’ve encountered so far. 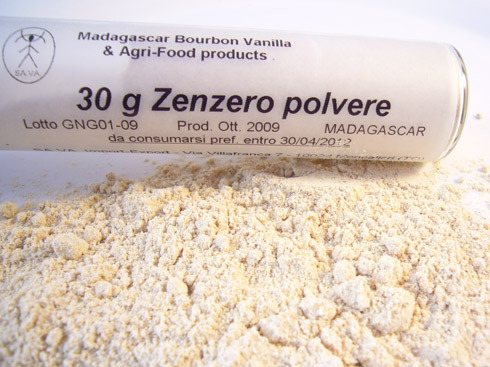 They have high-quality standard selections, such as Malabar and Tellicherry, along with relatively unknown varieties like Pohnpei and Kampot. Click on the pictures to enlarge. India Malabar – Medium size, light tan, wide range of colors. Soft texture. Cinnamon and nutmeg notes. Heat is warm and cozy. 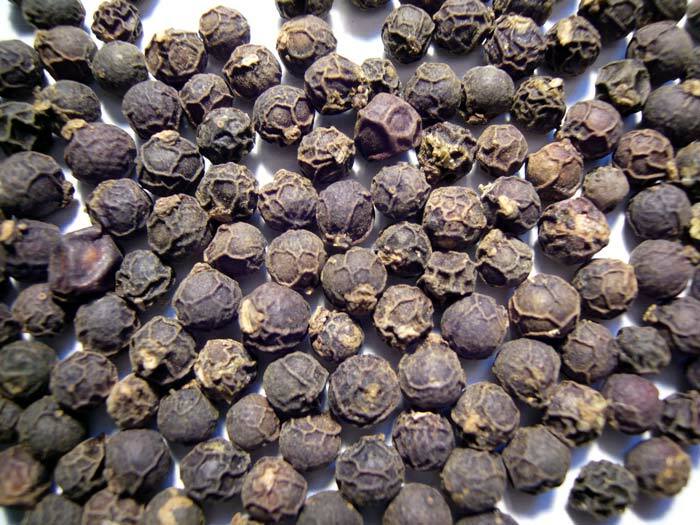 India Tellicherry – Medium-to-large size. Uniformly dark brown. Cedar middle notes, becomes slightly bitter toward the end. Light heat. Malaysian Sarawak – Large size. Array of colors, dark-brown to tan. Light, crispy texture. Bright flavor, slightly citrus. Light heat. Indonesian Lampong – Small. Black to dark-brown. Slightly soft texture. Bold, peppery flavor. Medium heat. Madagascar – Small size. Color varies from black to tan. Firm, crunchy texture. Middle notes of pine, followed by other spice notes such as cumin and coriander. Heat develops slowly, provides a lingering warmth. Ecuador Talamanca - Medium to large in size. Gray to black color. Notes of juniper, slightly tangy taste. Intense heat develops after about 10 seconds. The end flavor is slightly bitter. These don’t have the strong vegetal taste that I’ve noticed in some other Ecuadorian peppercorns. 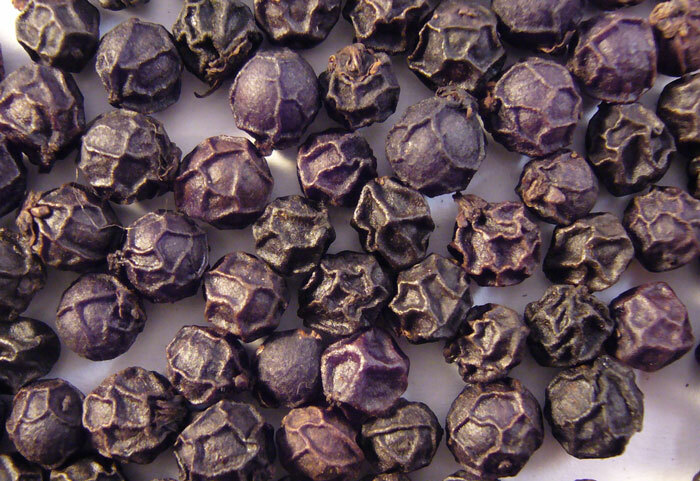 Vietnam – This is the first time I’ve found gourmet Vietnamese peppercorns. Medium size. Uniform brown. Texture is dense and hard. Average flavor, but the sensation of heat is more in the nose than in the mouth, which makes it a bit unique. Kampot – Large size. Black and shiny. Dense. Fruity flavor with a slightly bitter finish. Low heat. Pohnpei – Large and well-formed kernels. Color is deep black-purple. The flavor is floral, almost sweet, with notes of cedar. There is a fair amount heat, which seems to catch in the back of the throat. 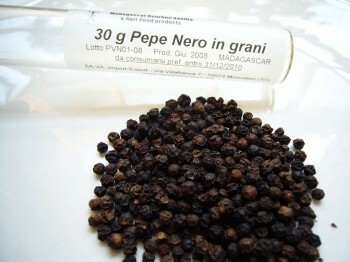 Peppercorns were sampled in their raw form. They were also used to season several common foods, ranging from bland (e.g., eggs) to pungent (e.g., andouille sausage, gumbo). Side-by-side comparisons were conducted whenever possible, but with this many peppercorns I had to rely heavily on notes from previous tastings. It was really an incredible opportunity, and a challenge, to compare this many different peppercorns. A big thanks to Pepper-Passion for making this possible. Cost: The Spice House provided samples for this review. 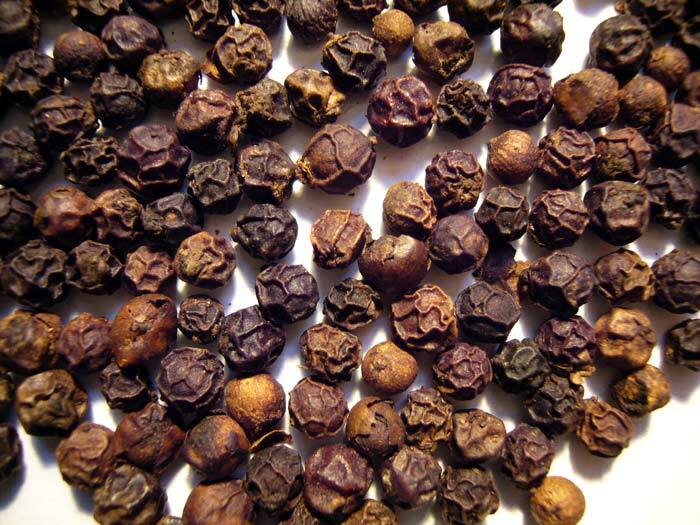 All three of The Spice House black peppercorn varieties are top quality, Grade A peppercorns. 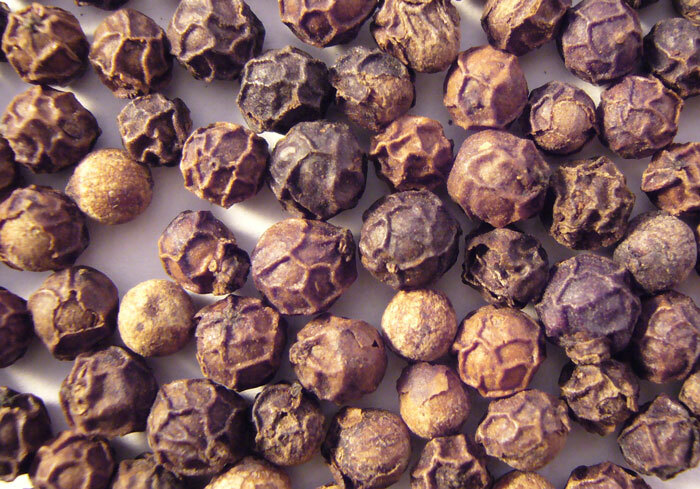 The peppercorns are nicely shaped, none are broken, and there’s no dust or plant debris. 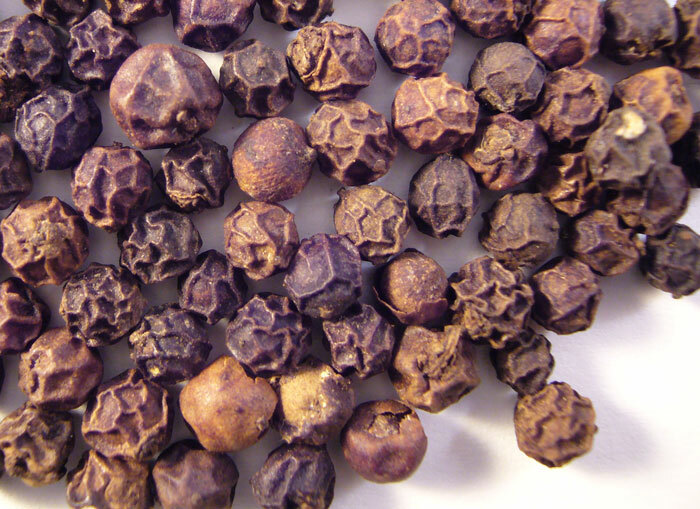 The Indian Tellicherry are very large, brown-to-black peppercorns. The aroma of a ground peppercorn is boldly fruity and floral. 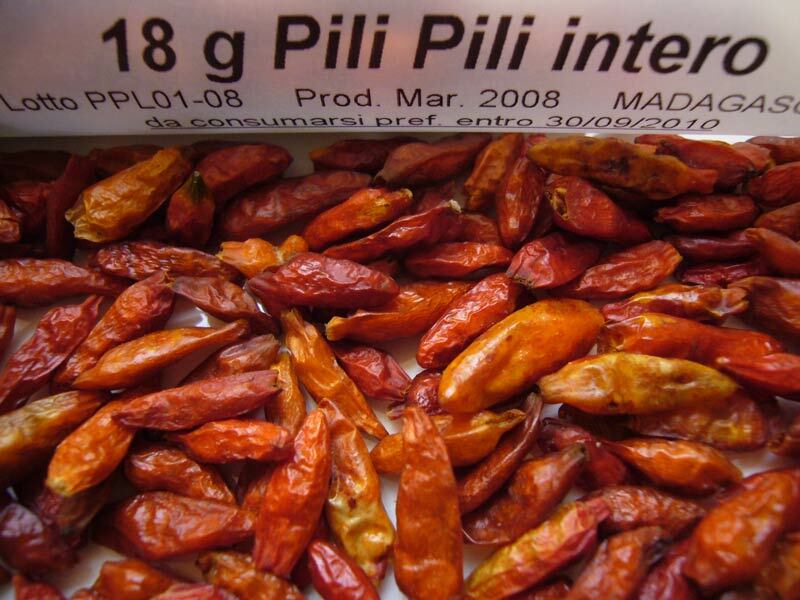 They have the most pungent, fruity peppercorn taste among the three samples, but are the least hot and spicy. The heat is lingering and warm, but not biting. These are the perfect everyday peppercorn. This is an interesting peppercorn with an unusual flavor profile. 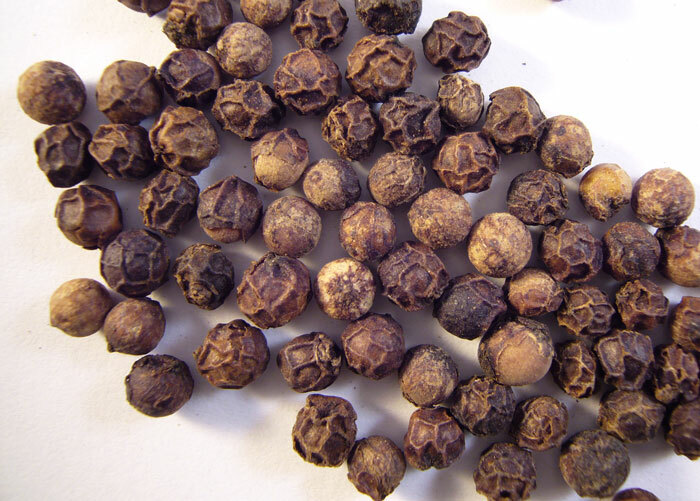 The medium-large peppercorns fall somewhere between Tellicherry and Lampong in size. They are a unique greyish-brown color. Each peppercorn has a nib where it was attached to the spike, something I’ve never seen on other types. The aroma is sharp, spicy, and somewhat vegetal. They have a ton of fantastic peppery heat, with a planty, tangy, slightly bitter flavor. 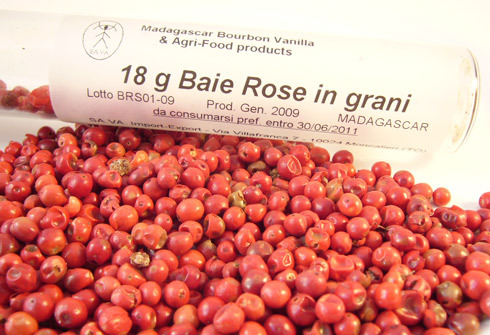 The taste has an almost fertilizer-like overtone that is unique to this peppercorn terroir; the organic growing methods and location of the plantation close to the equator may account for the interesting flavor characteristics. I really love the heat of this peppercorn, but the flavor is not my favorite. 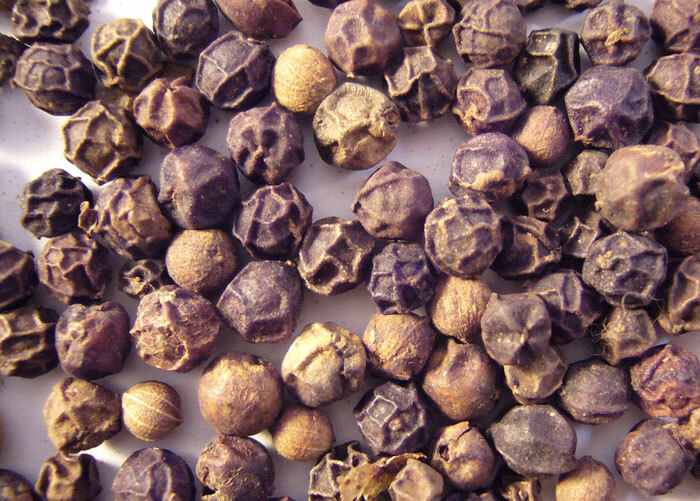 Try these peppercorns for a unique flavor that tastes very different than other varieties. 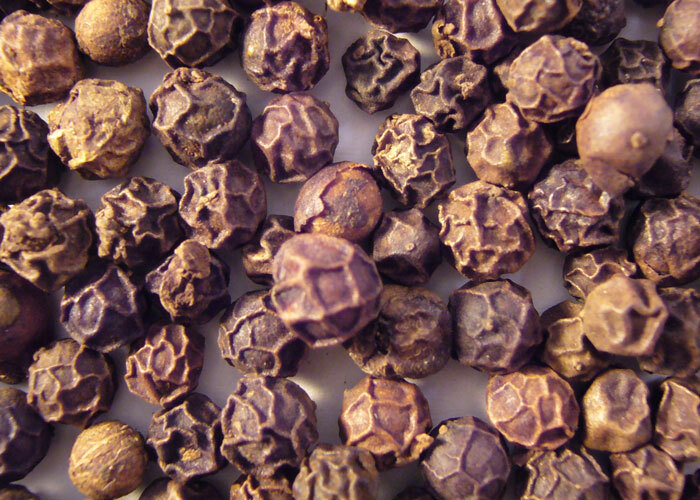 Indonesian Lampong peppercorns are small, and dark brown-to-black in color. The aroma is sharper, hotter, and less fruity than a typical Indian Tellicherry peppercorn. 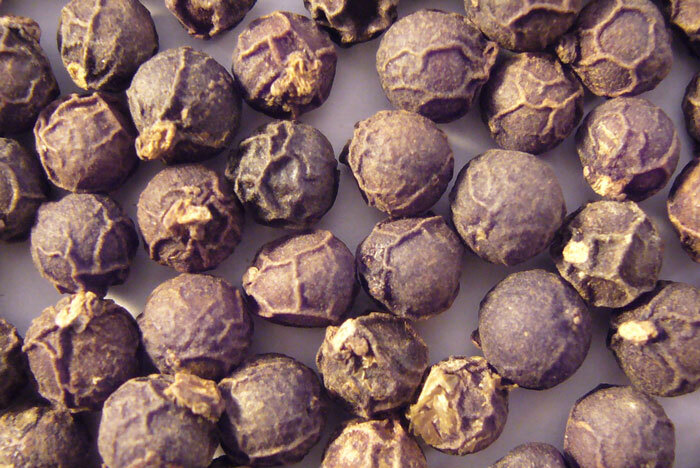 Lampong peppercorns are picked while very immature, which gives them extra heat. They also have distinct sassafras overtones, similar to Madagascar peppercorns. These are the first Lampong peppercorns I’ve tried, and they’ve replaced Tellicherry as my standard kitchen peppercorns. This is a must-try peppercorn. Cinnamon reviewed: Ceylon; Indonesian, Chinese, Vietnamese cassia. The story of The Spice House and Tom and Patty Erd begins with the national Penzey’s Spices retail chain; Patty is the daughter of the Penzey’s founders. I really like The Spice House website because it’s thorough, informative, and user-friendly. Most of the reviews seem to be written personally by Patty. Ceylon cinnamon has a bright, citrus flavor that’s different than the cassia typically found in American stores. The Spice House’s Ceylon cinnamon has a very light, yellow-tan color. The taste is very sweet on the tongue. The Ceylon cinnamon “soft-sticks” are made of flaky, light, fragile layers that are easy to grind at home. 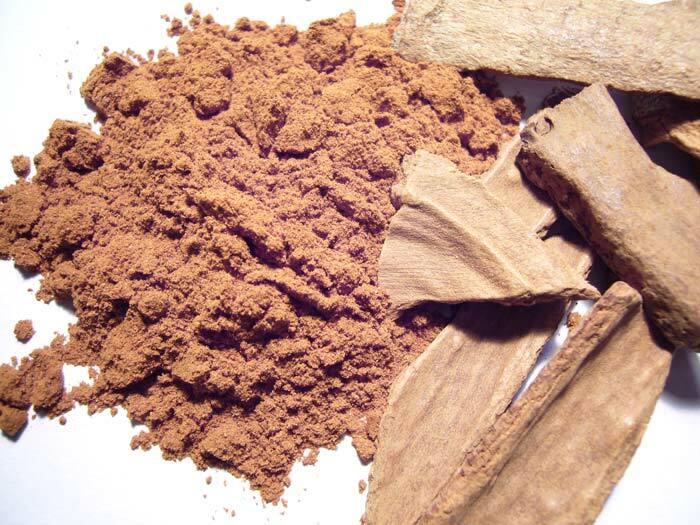 Use Ceylon cinnamon where it’s culturally appropriate, such as Mexican food. I also like a 50%/50% blend with Vietnamese cinnamon for exciting, unique cinnamon rolls. 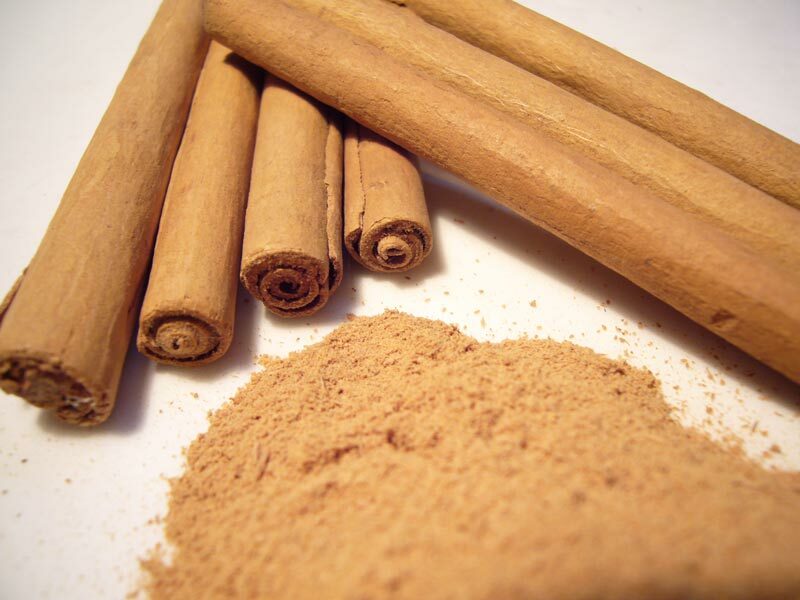 Cassia is the typical American baking cinnamon, with a darker, more robust flavor than Ceylon cinnamon. I made a batch of oatmeal cookies with each cassia cinnamon from The Spice House. The ingredients and amounts are equal except the type of cinnamon used. 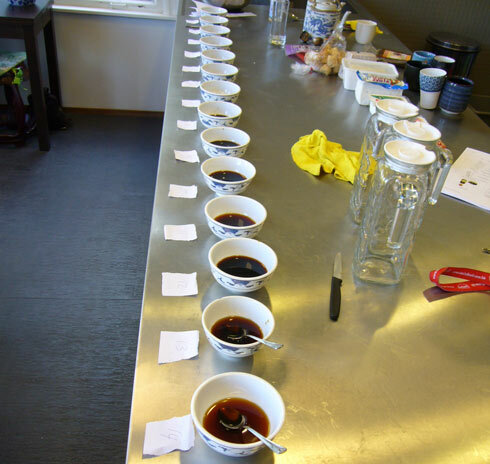 The three batches were taste-tested by a large group of colleagues, and the comments are summarized in each description. This is only an evaluation of the flavor of each cinnamon in oatmeal cookies, the results would no doubt be drastically different in another dish. The Chinese cassia from The Spice House is the lightest and sweetest of the three cassia varieties. It actually seems to enhance the inherent sweetness of foods, so use with caution when baking. The color is tan, with light red tones. 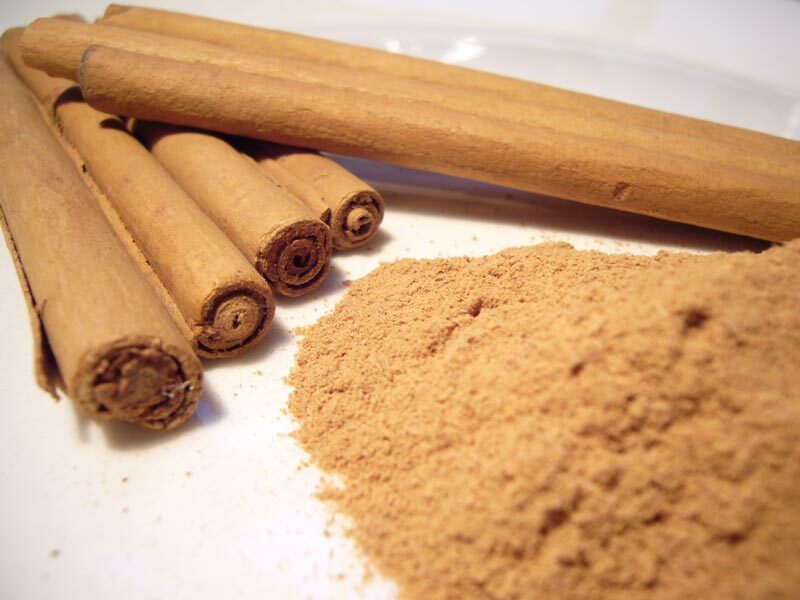 It is a simpler, smoother cinnamon, the flavor doesn’t really stand out on its own. 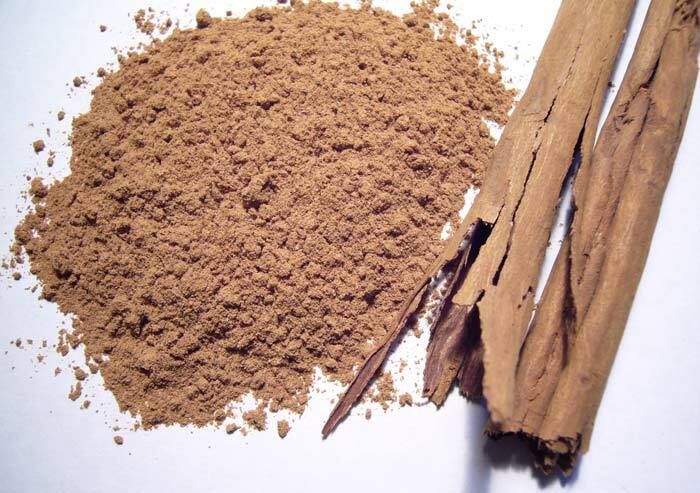 It would be appropriate for everyday use in spice blends or dishes where cinnamon is a background flavor. It was my least favorite of The Spice House cassias. Indonesian Korintje is the most common variety of cassia; grade B and C are typically sold at supermarkets. The Grade-A Korintje cassia from The Spice House is higher quality than the stuff you can buy in the grocery store. The color is a bright, rusty orange. The general taste of Korintje is best-described as “traditional”, and brings to mind spice cookies and cakes. The Korintje from The Spice House is very fresh, and has a fantastic piney, effervescent quality that distinguishes it from other sources. I also find it fresher than Penzey’s jars of Korintje (this could be due to packaging differences, though). The pungency is somewhere in between Chinese and Vietnamese, and people who find Vietnamese cinnamon too strong may prefer Indonesian Korintje. Vietnamese cinnamon is always a favorite here in the VanillaReview test kitchen. The sample from The Spice House is dark brown in color, with deep red tones. The aroma of is overwhelming and rich; it’s definitely the strongest of the three cassia samples that I received. The flavor is deep and heavy. It has some heat, and is the only of the three samples that really makes your tongue tingle. Use in dishes where cinnamon is a feature flavor; voted best for oatmeal cookies in the taste test. 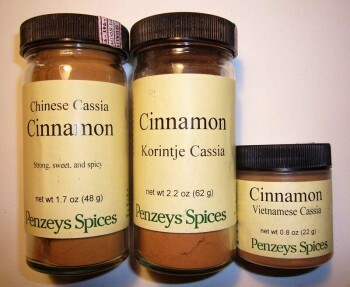 Penzey’s Spices, a spice outlet with stores and mail order, carries three varieties of cassia cinnamon, as well as a ceylon cinnamon. I bought the three cassia varieties because multiple cinnamon terroirs are really difficult to find. You can check out all Penzey’s cinnamon products here. I tried each type in a batch of oatmeal cookies, my favorite cinnamon vehicle. This is a high-quality version of the cassia you buy in a supermarket. Its taste and smell are stronger and fresher than the typical, store-bought stuff. The color is vibrant orange, with tinges of cayenne red. Its flavor is clean, soft, classic, and sweet – especially in baked goods. It’s “simply cinnamon”, with very few unique characteristics of its own. In the oatmeal cookie test, this cinnamon was too sweet and one-dimensional to carry the cookie by itself. It would be perfect for spice blends where cinnamon isn’t a feature flavor, such as curries, gingerbread, or spice cakes. This is my least favorite of Penzey’s cassia varieties. 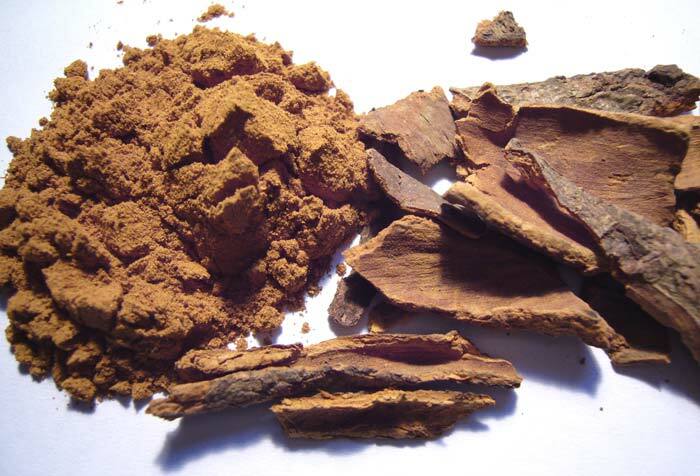 The color is rustier and browner than the Korintje cassia, and it doesn’t have a very strong cinnamon aroma. There are dusty, musty overtones that remind me of a used bookstore. It gives me an “old forest” kind of feeling. Fortunately, the cookies didn’t taste musty. This cassia has slightly more personality than Korintje, but in my opinion, not enough to stand on its own as a feature flavor. The cinnamon taste is less pungent and spicy than the other types, and leaves the palate quickly. Another good candidate for blending, or perhaps delicately-flavored cinnamon treats. Which cinnamon is the “best” is a matter of taste. Vietnamese cassia has a bad reputation with some, but it’s my personal favorite. I find it to have the most exciting flavor and aroma of the three Penzey’s products, and it really motivated me to learn more about cinnamon. The color is a golden brown with some orange hues. The smell is spicy hot, sharp, and overwhelming. This is a strong, pungent, smack-you-in-the-face cassia! It isn’t as sweet-tasting as the others, but rather has a dark, bold quality that makes it great as a feature flavor. 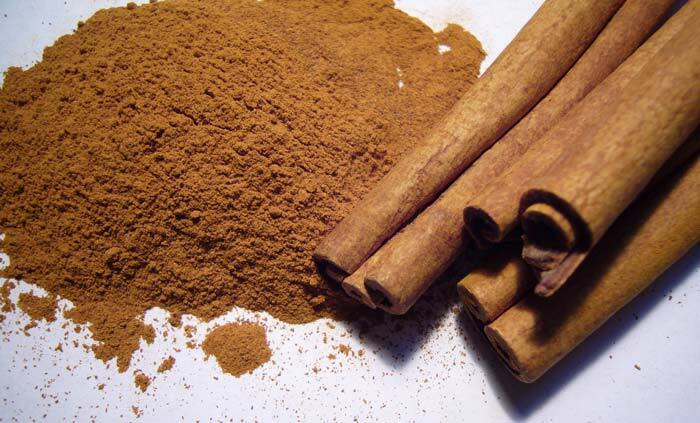 If you don’t intend for cinnamon to be a stand-out flavor, use something else. The bottle from Penzey’s recommends using 1/3rd less than your recipes call for, but I usually use the full amount because I really enjoy it. It made fantastic oatmeal cookies with a rich, complex taste. Madagascar cinnamon sticks, SA.VA. Import – Export, 3€ per 3 sticks. Cinnamon is a favorite holiday spice, perfect for Santa’s cookies and Christmas morning sticky rolls. 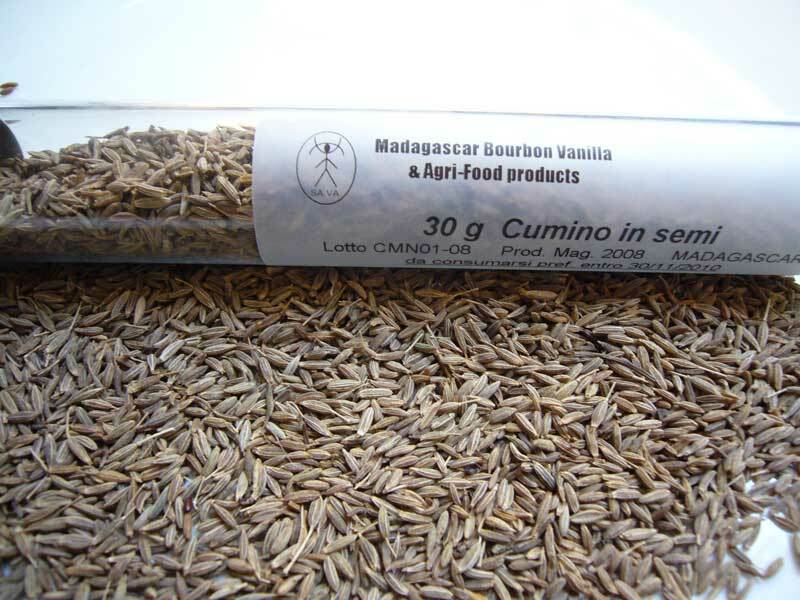 SA.VA.’s Madagascar cinnamon is different from the bland, ground powder at the local market. The ground sticks have a bright, hot, citrus aroma. It makes me think of cinnamon bears or red hots. The sticks are made of thin layers, and I can crush them with my fingers and grind them in a coffee grinder — something I can’t normally do with cassia cinnamon sticks. All the cinnamon from Madagascar is regarded as cassia, although very different from the cassia usually sold in the European supermarket. So this cassia classification does not make happy the Madagascar cinnamon producers, that would prefer another denomination, as for instance the “Madagascar cinnamon” that we’re using in our technical schedule. accessories from the babystroller-reviews every time I visit them. With a citrus aroma and delicate layers, this Madagascar strain is a cassia that shares many characteristics with ceylon cinnamon. It is unique in the world, and will surely add a personal signature to your baked goods. 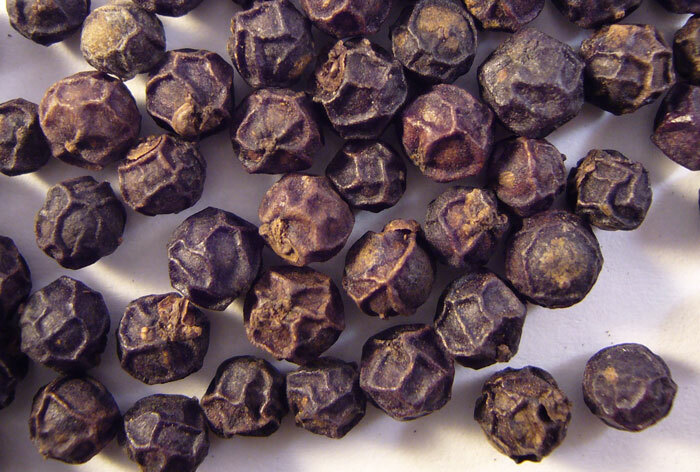 Black peppercorns, SA.VA. 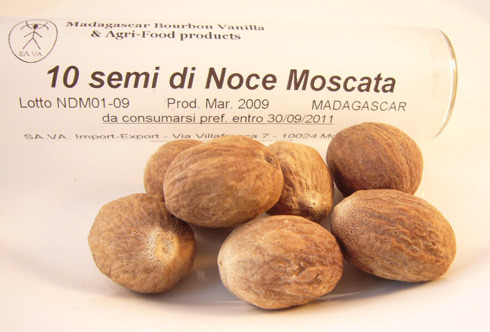 Import – Export, 5€ per 30grams. 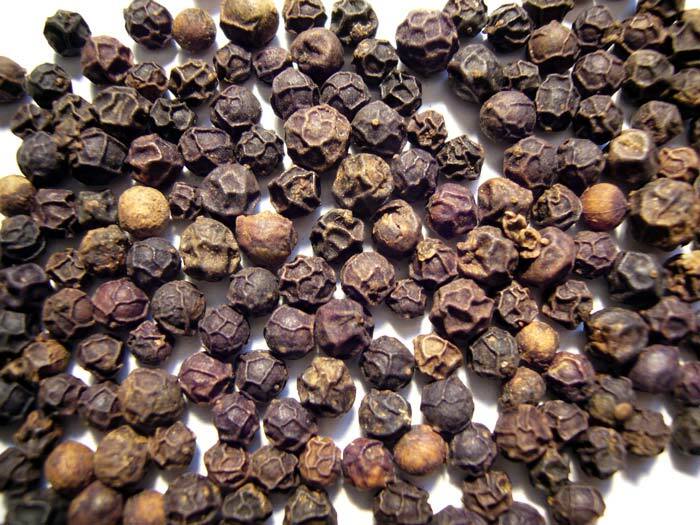 Black peppercorns are one of my favorite spices. When Edith at SA.VA. 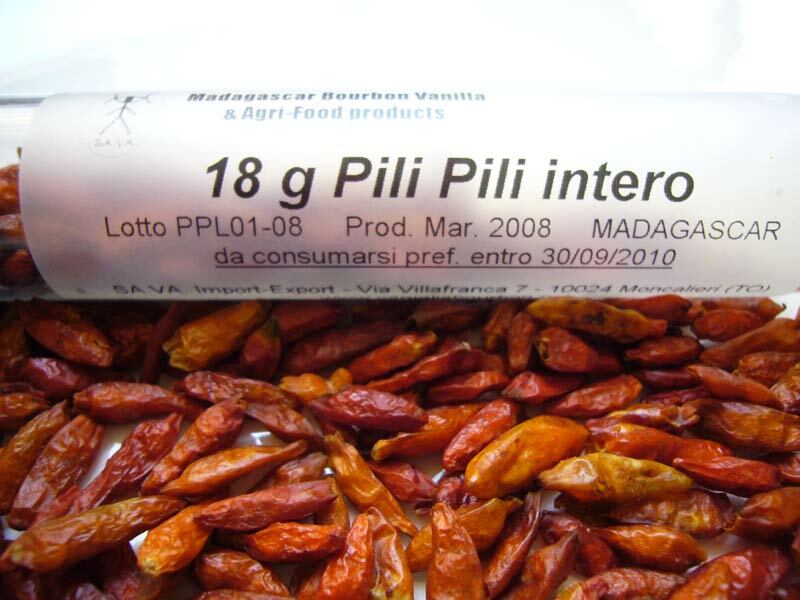 Import – Export asked if I would evaluate some fresh spices flown in from Madagascar, I jumped at the chance. SA.VA.’s spices are transported by plane, rather than shipping container. Most spices lose flavor during transit through tropical areas in metal shipping containers. SA.VA.’s spices are flow in to preserve the intense flavors and freshness. SA.VA.’s peppercorns are the most aromatic and fruity I’ve ever tried. It’s not as hot or ‘spicy’ as an Indian ‘extra bold’, but it’s significantly more pungent and flavorful. Fresh ground, they have the strong pungent aroma of sassafras oil, probably from a high concentration of the chemical that makes black pepper tasty, piperonal. Really incredible peppercorns, I can tell the difference that air transport makes. 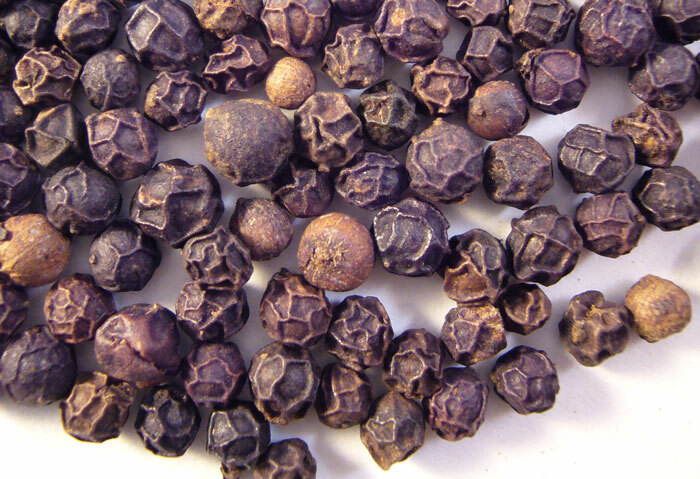 If you like black pepper, SA.VA’s fresh peppercorns are a surprising and unique treat. 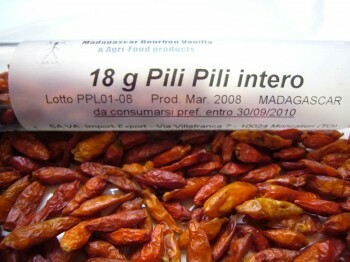 Highly recommended to any gourmands and foodies out there, this is a peppercorn you won’t soon forget.